I always think of myself as a healthy person, with an active lifestyle and a balanced diet and that is probably why what I am about to share with you came as a shock. A while ago I was approached to write a blog post about the DEXA scan. I was offered to go take a Lifestyle DEXA scan that would measure my body mass composition in exchange for a post. It certainly intrigued me to find out more about my muscles and possible asymmetries, especially because as a Yoga teacher I often demo poses and sequences only on one side, which could lead to differences between one side and the other. So I got online to book. 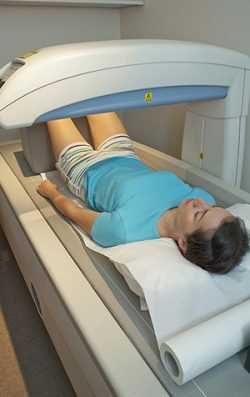 Unfortunately, (or fortunately, as it turned out), the London clinic I contacted didn’t offer this type of scan anymore and suggested instead to take a DEXA scan to measure bone density. I went in for an appointment, pretty confident I had healthy and strong bones, given my balanced diet, active lifestyle and age. Turns out I was wrong. After I had the scan at Oryon Imagining, (Marylebone, London), which lasted about five minutes. I was given the images and an automated computer reading in an envelope. I was told I would receive a doctor’s report by post in a few days and my GP would be sent one too. As I stepped out of the clinic, on my way to teach my evening yoga class, I opened the envelope. With shock and astonishment, below the actual images there was a very clear, brief report that showed my results weren’t normal: I have vertebral osteopenia. I was surprised they would just let me go out like that, clear results in hand, but no information on what they mean or how to improve the health of my spine. The scan tested my hips and lower back and while my hips are doing well, my lumbar spine bone density is lower than it should be. So of course, I went onto Google to find out what that meant. Osteopenia is the stage between healthy bones and osteoporosis. It increases risk of osteoporosis and bone fractures. It usually occurs around age 50 (I am 33!). Diet and exercise can make all the difference in preventing this disease, apparently. More on this below. A few days later, I finally received a letter in the post with the doctor’s report. I was a little scared to open the envelop, so thought I’d wait until I wasn’t alone. To then change my mind five minutes later and open it. The “full report” was a page with only a few words on it, and less information than on the first report I was given on the day. The doctor’s reading stated: “patient has lumbar osteopenia”. Which I already knew! How frustrating. I have then asked physios, osteopaths, nutritionists I know about their view on the results, while waiting for a GP appointment and hopefully a specialist’s referral and further investigations. Interesting enough, for the last 18 months I have had frequent pain on the right side of my sacrum and pelvis. I have seen many specialists about it and no one has found anything that could be possibly causing the pain. Could it be connected to the low bone density? I am just at the start of this journey into improving the health of my bones. I have much to learn and discover still. How are osteopenia and osteoporosis diagnosed? With a DEXA scan. Private rates start from around £65 in the UK. How to increase meaningful bone density? It is possible to increase bone density through diet, exercise and lifestyle changes. Helpful foods are green vegetables rich in calcium, such as broccoli and kale. Bone broth, fatty meat with skin, soya beans, tofu, nuts, fish where you eat the bones, such as sardines. There is a debate on whether dairy products are good or bad for bone density. Foods to avoid are processed carbohydrates, too much grains, sugar, soft drinks. Bones are constantly remodeled by our movement or lack of it. Walking, running, weight lifting, weight bearing, and resistance activities help build stronger bones. Stop smoking, drinking soft drinks, limit alcohol to max 2 units a day. Ensure you have appropriate levels of Vitamin D and if you don’t get much sunlight, a supplement is likely needed. Check your hormones (regardless of your gender). Decrease your chronic bad stress. Make sure you get enough quality sleep, as your body repairs itself when you sleep. Note: certain medications affect bone density (ask your doctor).